Your return assumptions for retirement can make a huge difference. Dividend champions are less volatile over time and can ensure a more stress-free retirement. We ran what-if scenarios on a retirement, showing just how important the rate of return assumption is. Those lucky enough to have had a 401(k) plan in the early '80s through the late 1990s very likely saw their wealth soar during that time. That is because the stock market, as measured by the S&P 500, rocketed over 1,100% during that time. On an annual basis, that is 14% per year in terms of the annual return. If we strip out inflation each year, the real annual rate of return was 10.4% during that time frame. It is pretty astonishing what a 10.4% real rate of return can do for a portfolio over a long enough time frame. 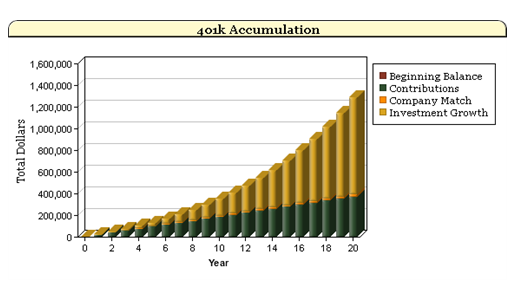 If we take a person who has nothing in his 401(k) plan, who maxes out his 401(k) contribution and receives a $5,000 annual match from his employer, he will have more than $1.2 million in only 20 years. Stock market and bond market returns should not be underestimated in terms of their importance for a retirement portfolio over time. Compounded interest truly is a powerful force and can make or break a retirement. This example also shows just how important it is to begin saving early and often. I want to look at a case study in retirement planning where we change the annual return assumptions. This will show us just how important this assumption in planning is. My case study uses a 30-year old couple that makes a combined $150,000 a year in income. Both are maxing out their 401(k) plan contributions at work, and they receive a $5,000 match from their employer. They currently have $40,000 saved in their respective retirement portfolios. Their asset allocation is 85% stocks, 15% bonds. I used historical data for stocks and today’s interest rates to come up with their annual rate of return assumption. Their average expected annual return in this scenario is 6%. I set the couple's retirement age to 65 in this scenario. The above results tell us that they are projected to have over $2 million at retirement and over $2.1 million at the end of their plan, which is their life expectancy of 85 years. As I mentioned before, saving early and often is the best way to ensure you have enough money for retirement. This case study bears this out. I ran some more scenarios, this time reducing their rate of return assumption in 1% increments. You can see how drastic the decline can be when our rate of return assumptions don’t pan out. This is the power of compounding in reverse. Over long time periods, a decline in annual returns has a very large negative impact, just as an increase in returns has a large positive impact. Interest rates have gone up quite a bit this year, and this is a good thing for investors over the long run. Just a year ago, investors could not even get inflation out of their bond returns, and that is before taxes are taken out. But treasury yields are still very low by historical standards, and certainly not high enough by themselves to generate enough income in retirement for most people. This is why I still recommend Dividend Champions for most retirement portfolios. A diversified basket of rock-solid dividend payers can reduce the volatility of portfolio returns, even in recessions. The reason is that as time goes on, your dividend portfolio’s return becomes more and more due to dividends. And dividend returns are much less volatile than the price return component of the stock market. Some of my favorite Dividend Champions for retirement are Exxon Mobil (NYSE:XOM), Walmart (NYSE:WMT), Procter & Gamble (NYSE:PG), and Johnson & Johnson (NYSE:JNJ). These companies not only have a long history of increasing their dividends every year, but they have also shown that they can do so during tough economic times. Just witness the last recession, where each of them managed to increase their dividends during the downturn. By adding lots of great dividend payers to your retirement portfolio, you won’t be as susceptible to market volatility, which can cause many sleepless nights. It’s a good feeling to have those dividend checks keep coming in, even when the market is declining. Disclosure: I am/we are long XOM, WMT, PG, JNJ. I wrote this article myself, and it expresses my own opinions. I am not receiving compensation for it (other than from Seeking Alpha). I have no business relationship with any company whose stock is mentioned in this article.